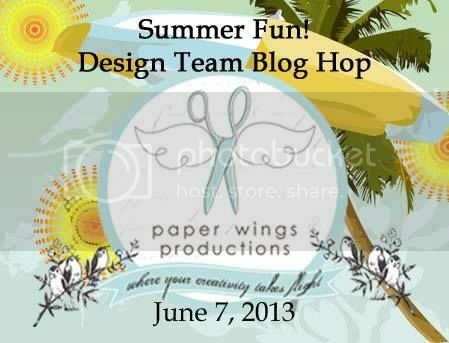 WELCOME to the “Summer Fun” Paper Wing Production's Design Team Blog Hop & Giveaway! If you've arrived here from The Aviary, then you're in the right place. If you’re just stopping by for a visit, I’d love for you to check out our hop...you will not be disappointed! 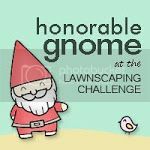 I am honored to be the first stop for this blog hop! This month we’re sharing some “summer fun” themed projects. So sit back, grab yourself something cold to drink or better yet some ice cream or frozen yogurt and enjoy a little Paper Wings Productions summer inspiration! Oh and let’s not forget about the blog candy!! 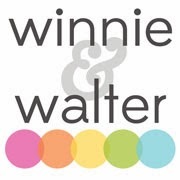 This month we’re giving away a gift certificate to the Paper Wings Production’s online store AND there will be some blog candy along the way!! to increase your chances of winning, like the Paper Wings Productions Facebook page and/or invite your friends to the hop. The winner will be announced on Tuesday, June 11th, 2013 on The Aviary. When I was brainstorming ideas for Summer Fun, I hit upon one of my favorite ways to spend hours upon hours: reading. 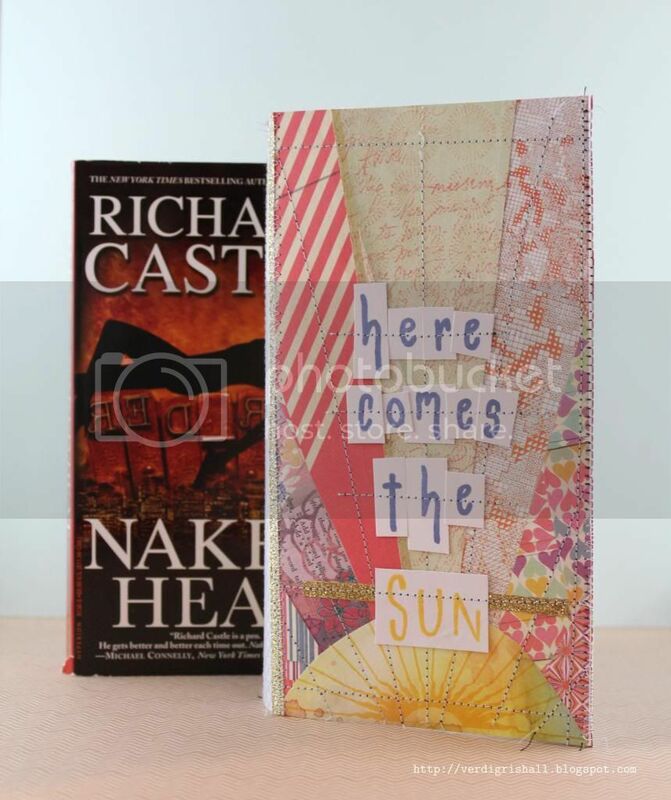 I thought why not create a book cover to disguise those steamy paperbacks that are so much fun to read? I know there are ebooks, but sometimes a good old fashioned book is just the thing poolside, on the beach, in a car, on the plane or sitting in the cool air conditioning. I started with Claudine Hellmuth's 8.5" x 11" sticky-back canvas thinking I would do some image transferring. In the end though I used the sticky-back canvas like a big fabric sticker. I freehand drew a sun ray pattern on a cardstock panel which measured 8.5 inches high by 4.25 inches wide (in the end the project ended up being 8 inches high as I didn't need as much height). I numbered each of the parts and then cut them out (I cut each shape out twice as I made two panels for the front and back). I used those pieces as patterns to trace onto pieces of patterned paper from the Basic Grey|Sassafras Soleil collection. I stamped the sun from Earth and Sky or Sunrise and a line from Window using yellow ink onto the half circle shape. 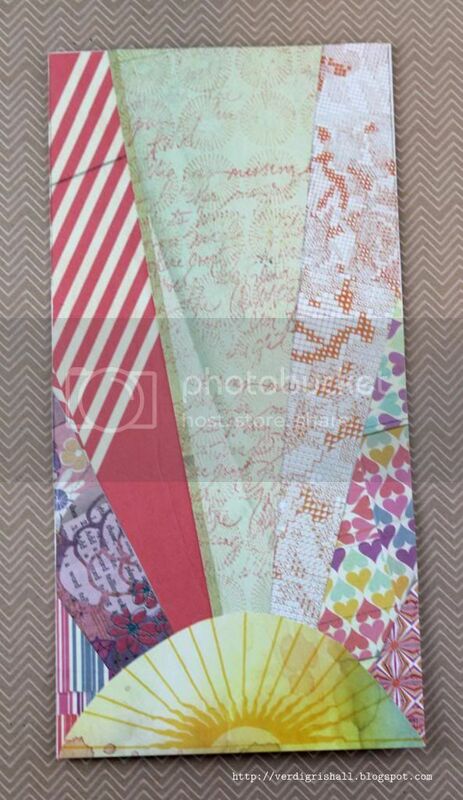 The largest center ray piece I stamped over with the Backgrounds or Circles background and Writing Backgrounds or Writing stamps. I adhered (using some liquid glue) each sun and its ray to a piece of cardstock measuring 8.5 x 4.25 inches using the numbers from the pattern pieces as guides. Don't worry if things aren't perfect because you are looking for a handmade mismatched look anyway. On the piece of sticky back canvas, I measured 0.5 inches on each of the right and left sides to be folded over as flaps to fold into the book to keep the book cover over the book. I actually cut two one inch wide strips from patterned paper for these sections. I measured for center and decided to create an inch wide spine that I then cut out from patterned paper. Removing the backing to the sticky-back canvas and with the sticky side up, I placed the center strip at 5 inches (it will then take up the place of 5 inches to 6 inches on the canvas). The panel I wanted as the front cover I placed on the right side butting up next to the center/spine 1 inch strip of patterned paper. I placed a one inch strip to the right side of the front panel. Next I placed the back panel to the left of the center strip and finished off by adding the last one inch strip to the left of the back panel. I lined up the panels to the bottom of the sticky-back canvas as any cutting I would be doing would be to the top of the canvas. Happy with the placement, I used a bone folder to burnish the paper onto the canvas. I cut any overhang of paper from the canvas and added some strips of brown sugar glitter tape on the spine for more interest. Then I actually got out the sewing machine. This should garner a response of shock and awe as the sewing machine and I have a very peppered past. Anyone aware of my sewing abilities knows I have a much better relationship with the seam ripper. I want to assure you that I was very pleasantly surprised by how easy it was to sew on this project. If I can do it, ANYONE can do it! I went to town sewing all over the canvas. Have fun trying different color thread, different stitches, free style stitching as this is the perfect type of project to play with the sewing machine or if you are able and willing hand stitching. Next I stamped "here comes the" from Funky Lower Case Alphabet with blue/purple ink on white cardstock. I cut out each letter as little blocks not worrying about size or straight lines. 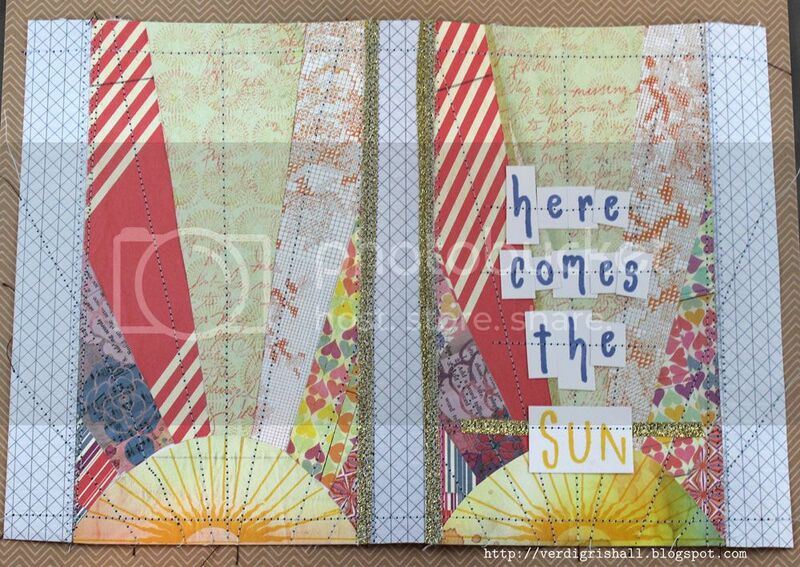 Then I stamped "sun" using Funky Alphabet (the uppercase version) in yellow ink and cut out the entire word as one block. I used a little liquid glue to adhere each letter to the front panel. I placed a strip of brown sugar glitter tape down under the sun block. I then sewed across each word. At this point you can add more stamping, sewing, painting, doodling, embellishments or not. When you are happy with it, I recommend for more durability painting on a few layers of modge podge or soft gel medium to seal the piece. This book cover will fit those odd long paperbacks or a paperback of around 350 pages. 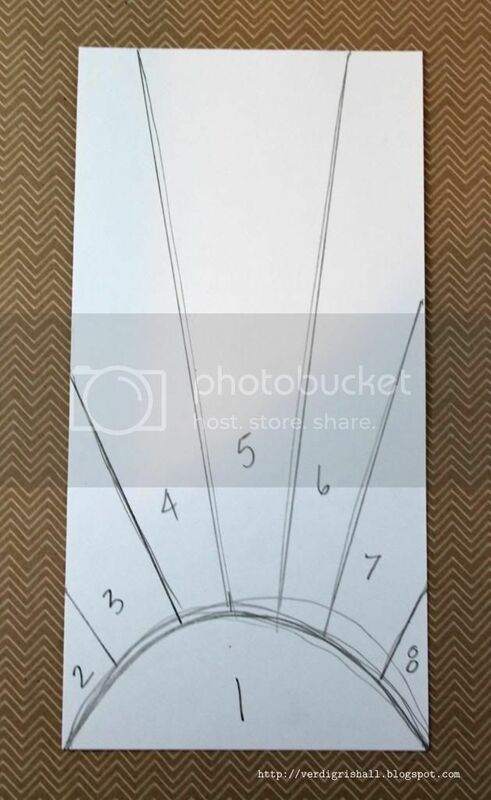 I think that if you used a 12x12 inch piece of sticky-back canvas or used more than one 8.5 x 11 inch sheet you could make a wider book cover for thicker books or even one that fit trade paperbacks and/or hardcover books. This would be fun to make again and the possibilities are endless on how you could decorate it! Now you can hide that guilty pleasure of a book (Fabio-like men hidden from prying eyes) behind your artsy book cover or give one to a friend with a book or books and/or gift card as a considerate gift. If you try out this idea, please let know because I would *love* to see it! Now, make sure you check out each and every stop on the hop starting with the very talented lady that makes all things Paper Wings Productions possible, Carrie Avery. It has been an absolute delight to have you visit me today and I hope this helps kick start an amazingly creative and fun summer! What a clever idea and beautiful design! Oh...and I saw a book I may have to read this summer! Thanks for the inspiration! What a great idea, Shay! I luv the sun and rays! I tried a sun and ray type layout in my art journal, but they didn't quite turn out as nice as yours did. I guess I didn't measure, (ha ha)at all. LOL!! 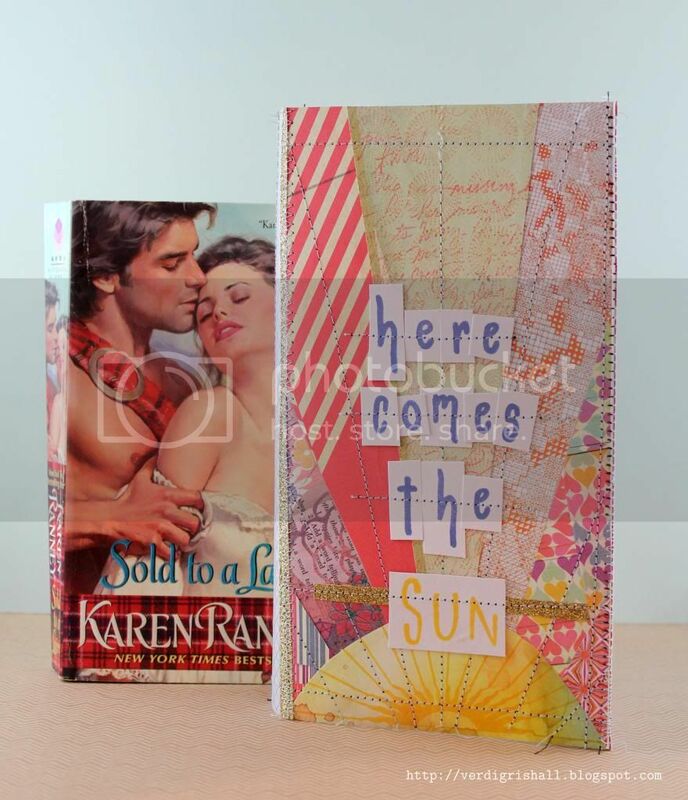 What a cute way to cove up those embarrassing novels that are just too good to not read! Love all the work you put into this. What a cute design - love the rays!! What a great idea! The cover is beautiful! This is so fabulous!! I'm a voracious reader - I never leave the house without a book - so this would be perfect for me!! 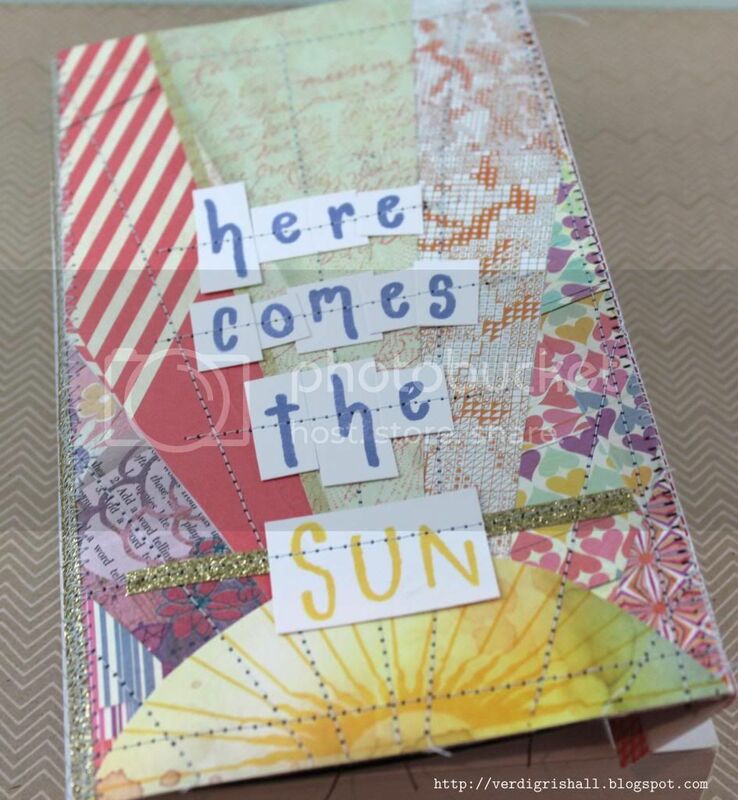 I love the sunburst design and the papers you used!! So awesome!! What a fun creative idea! Love this! 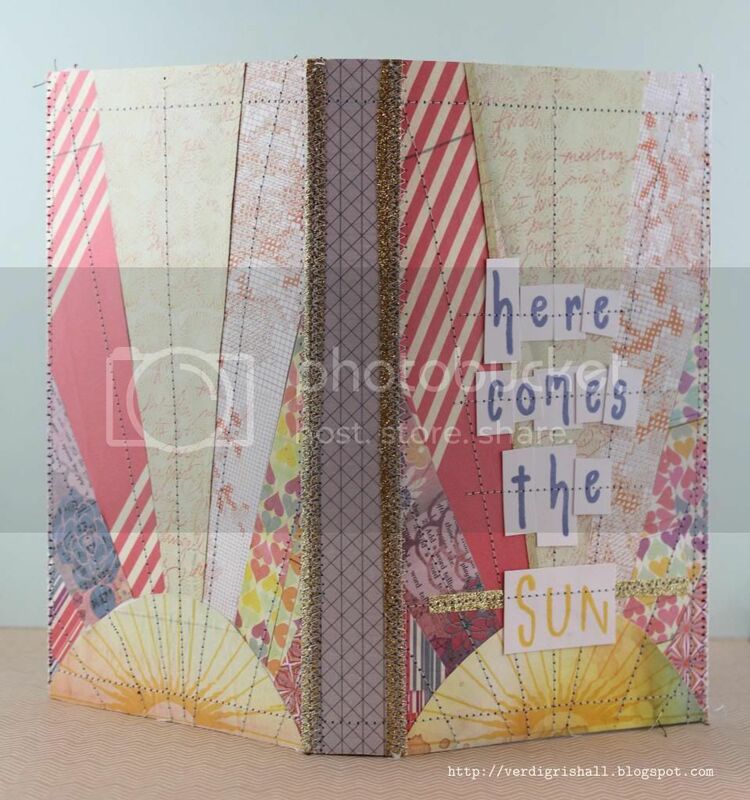 Super cute idea, love the patterned paper sun ray! Great project Shay. I love sun rays. Thank you for making it a tutorial! We all love how-to's!